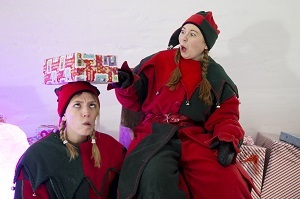 Learn more about my favourite friends, The Saariselka Elves! Did you know that elves have their very own language? It is called Elfish! But don’t worry, when you meet my friendly helpers, they still understand enough English to have lots of fun! Just make sure you behave, otherwise you might end up on the naughty list!!!! The elves in Saariselka are not as short as some of the other tribes of elves, as they get to spend lots of their time outdoors! Because the snow is SOOOOOO deep, they have to be a lot taller. Also, with the cold temperatures, their ears and noses aren’t quite as big as other elves you might have seen. 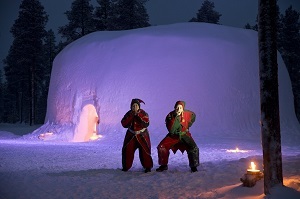 But the most important thing to remember is that Saariselka elves are known for many things, which leads us to…. My Elves are very very excitable, playful and even a little mischievous! They are also the kindest elves in the world! So you are bound to have LOADS of fun with them! Ever wondered what Elves eat? They can eat almost anything, but they definitely prefer all things sweet and sugary! Although Elves seem very childlike, they study for years and years and do LOTS of training at elf school so they can become one of my prestigious main elves! 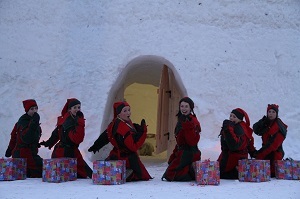 I hope you enjoyed learning more about my best friends and hard workers, the Elves of Saariselka! The only thing to do now, is to come out and get to know them yourself! We all cannot wait to meet you!